Welcome! It’s Wednesday, so that means it’s time for another Colour Me! challenge post. The challenge this week is to create a project using grey, yellow, and fuchsia. I’m not sure if I’ve ever mentioned this before, but grey is my favourite colour so naturally I was pretty excited for this challenge. As usual, I have a video tutorial to share. You can watch it below, or on my YouTube channel. When I started out with my card, I had a vague idea of where I wanted to go. The most solid idea was to use the Waves Background stamp and Distress Ink to create a bold background. 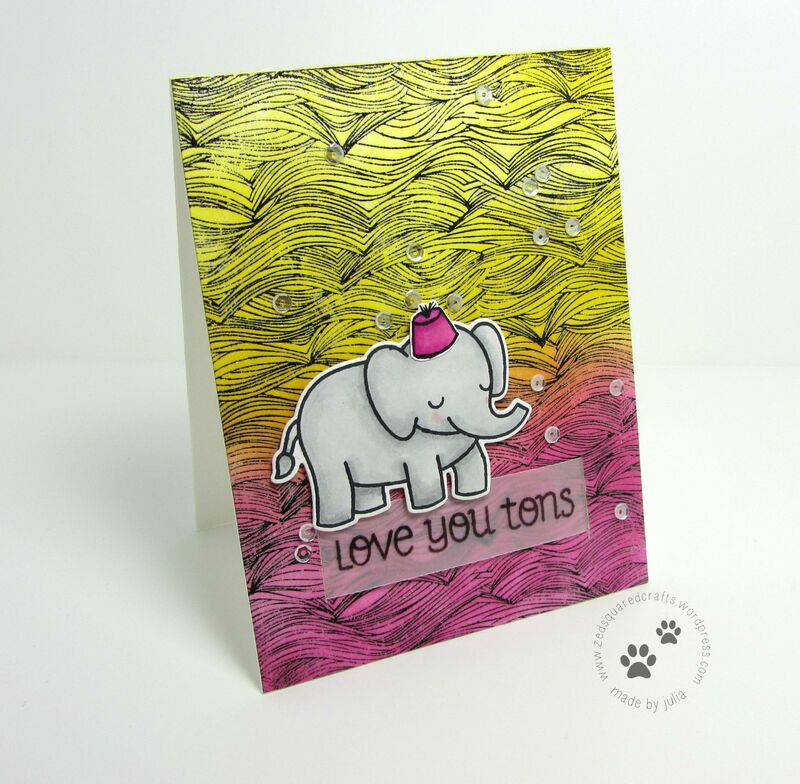 I also knew that I wanted to use the large elephant from the Critters in the Jungle stamp set as my grey element. Once the card was close to being assembled, I realized that it really needed something else. I decided the something else was a tiny and silly hat for my elephant. So, I did something I’ve never done before, I drew my own accessory. I started in pencil, and once I was happy with the shape, I used a thin marker to trace the outline and coloured it in with Spectrum Noir alcohol markers. I fussy cut it out, and then used a glue dot to adhere it to my elephant friend. I think this simple detail is what really brings this card to life. Here’s the thing though, I am not very artistically inclined, so this was a BIG leap for me. I feel like my whole world has opened up now since I feel more confident to add my own simple elements to my projects. If you’re not sure about where to start, I recommend Googling some images to get you started and just experiment. I know there are accessory stamp sets available, but if you’re like me and have a limited stash, I think drawing your own really opens up options and helps you get more out of your supplies. Julia, another stunning piece of work. I love the effect! Absolutely love the fact that we the bunch of inky fingers can create our very own background! I kinda stop getting pattern papers nowadays! 🙂 Lovely…I can’t wait to see what you create for next week!